Helping Landlords, Realtors, and Home Sellers Get More Money! 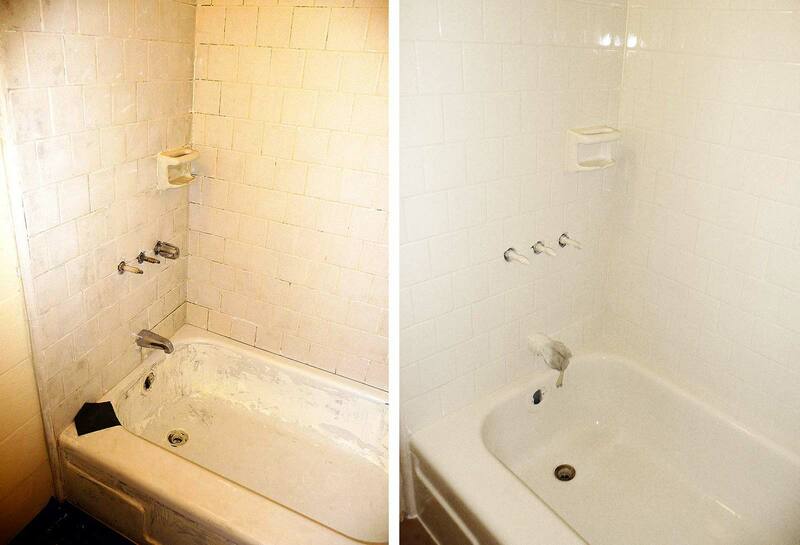 Northwest Tub & Tile Restoration Experts are the only Coeur d’Alene area refinishing company that specializes in helping landlords and Realtors get the best yield on their investment dollars, with less headache and faster time-to-market. We support the needs of your commercial property with services that could help you increase rents and sale price, while accelerating time to market. Refinishing is the single highest ROI improvement you can do for your property, with the added benefit of cost certainty. No matter how hard you clean, some stains will not come out. And a worn tub will never look new. For many buyers this will simply be a deal killer. Especially if alternative properties are available that have new looking tubs. Why risk it? For about 15% of the price of bathtub replacement, we can make the most important room in the house look clean and modern. Do you own or manage multiple properties? Contact us at (208) 966-1246 about our multi-tub discount! Don’t replace, refinish at a fraction of the cost! Contact us today! Hotels, businesses, & apartment complexes can save money by refinishing. 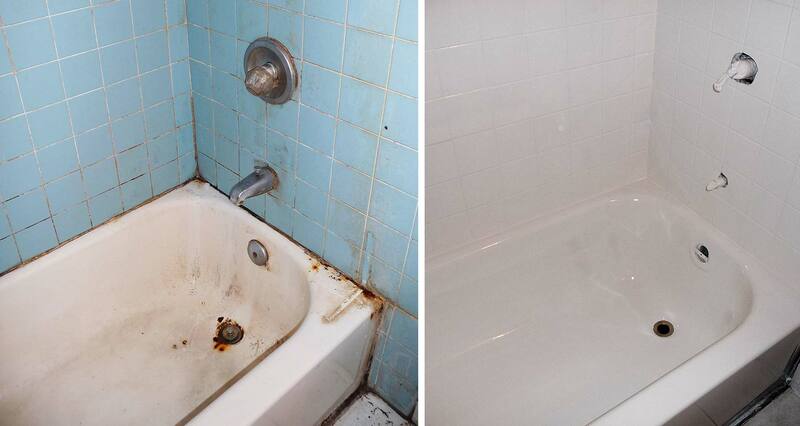 We will make your bathroom look and feel new for a fraction of the cost of replacement. We also know that every day your unit sits vacant costs you and/or your client money. We are fast and committed to getting the job done. Our services go beyond repair and resurfacing of bathroom and kitchen fixtures. Our advise has helped hundreds of investors get more money for their property. We may be a refinishing company, but our expertise doesn’t end there, and we aren’t biased towards refinishing if it is in our client’s interest to go in a different direction. We are asked a lot by homeowners on what exactly to expect on the day we refinish their fixture in their home. A lot depends on what exact service they choose and the exact fixture they want us to refinish. Most homeowners ask us to refinish a standard 5 foot bathtub. Our standard coating is the tried and true solution that works for every bathtub and delivers consistently fantastic results so that is what is detailed below. Prior to our arrival, please remove all items not stored in cabinets from the bathroom. This includes items around the toilet, items on the counter, and bottles stored in the tub. We will be masking your toilet and vanity area with plastic, so the cleaner this area is the better we can mask it off. Please also vacuum the bathroom as best you can. We will be temporarily turning your bathroom into a paint booth, so the cleaner and dust free the bathroom is, the better the results will be. Upon our arrival, we will start prepping the bathtub. This is a lengthy process. We don’t skip steps. If your bathtub has been previously been refinished, we will have to remove the old coating. We use a special system to do this, that minimizes dust. This same system is used when sanding fiberglass and plastics. Please be advised that there may be a small percentage of dust that can escape into your home. This can be easily wiped off with a damp rag. After any existing coatings are removed, we will thoroughly clean the tub and wet sand it to make sure there is no soap scum. Porcelain tubs, we will then treat with a chemical called etch. The purpose of etch is to degloss the porcelain so it can accept the new glaze.. We then thoroughly rinse the tub clean. Next we fix any repairs needed such as cracks, rust, chips, etc. At this time, we will begin masking the work area, and carefully covering everything in the bathroom to prevent overspray and protecting your other fixtures from settling of coating dust. We will set up our equipment just outside the bathroom including the exhaust system if it has not already been set up, which pulls 1200 cfm from the bathroom and sent outdoors and the sprayer. The entire prepping time takes about 3 hours if there is no stripping that needs to be done. If we have to remove an existing coating, it will take an hour to two hours extra. Just prior to spraying the coating, we will use tack cloth on the tub to remove any remaining dust particles. At this time, we will mix the coatings typically outside your home and give you notice that we will begin work. We go to every effort to minimize impact to you. We’ll position the exhaust system down wind when possible. the spraying process generally takes about 45 minutes to an hour. After we are done, we will start packing up our equipment, except for the exhaust system, which we leave running for another 30 minutes to remove residual odor from the bathroom. By the time we are done packing things up, we turn off and pack the blower, remove the drop cloths from the bathroom, and start to carefully remove the masking around the tub. We aim to leave our work area cleaner than we found it. Tired old-looking bathrooms have a negative impact on guest/tenant satisfaction and can lead to poor feedback on sites like Trip Advisor, Yelp, and other online review sites. Slip and fall issues relating to bathtubs and bathroom tile can result in law suits and higher insurance premiums. Failing to address these issues can not only damage your reputation, but also your future revenue. We pride ourselves on being able to offer very competitive commercial/group rates while never compromising on excellent workmanship and durability that our clients have come to expect of us. Low prices, unmatched service and good workmanship is a combination that makes us tough to beat. Northwest Tile and Tub has the ability, expertise, experience, man power, methodology, and the equipment to meet your tub refinishing needs. We can handle multiple refinishes per day per site in a production style environment. The commercial grade resin-based coating we prefer to use in high use commercial facilities is unsurpassed in durability. We recommend a 24 hour cure time to achieve maximum durability. Refinishing/Restoration typically costs about 20% the cost of replacement. Work done in one day, and the fixture is typically ready for use 24 hours later. Minimal disruption to other tenants or guests. There is minimal dust, odor, and very little noise. We expertly work around your property’s constraints and nuances. We accommodate your time-table and occupancy patterns. We clean up everything. No mess is left behind. Commercial customers referalls are available upon request. Bathtubs, ceramic tile and surfaces when even slightly wet become slippery, increasing slip and fall potential, and can cause disabling or fatal injury. Protect your organization against this risk by reduce slipperiness and increase traction with Northwest Tub and Tile No Slip Treatment. Unlike other products such as unsightly bathmats, traction strips, and textured coatings, our solution will improve traction and reduce slippery surface problems. This process will NOT change the look, color or appearance of the original material. This solution has been tested and shown to demonstrably enhance traction on wet ceramic and similar surfaces reducing slippery conditions and slip & fall risk. It is a professional grade product for use with ceramic tile, and porcelain or fiberglass tubs and shower enclosures to enhance traction and minimize slippery conditions. In practice however, it is a good idea to read the detailed care instructions below so your newly refinished tub stays looking that way. DO NOT use the surface for 24 hours as indicated by the refinisher who completed the job. DO NOT let a leaky faucet go un-repaired. Constant dripping will cause premature wear and rust around the drain. DO NOT use loose bath mats with suction cups underneath. DO NOT pick surface dust off with your finger. It is inevitable for some dust to settle on the surface while drying. It will feel a little picky at first, but will dissipate in 3-4 weeks with normal cleaning and usage. The best way to keep your tub clean is to wipe it down with a squeegee after the last use of the night (or morning). It does not have to be completely dry, but we recommend using a towel to wipe the horizontal ledge and the caulk as dry as possible. If you do this, your caulking won’t get moldy, and won’t have to be replaced for a long time. DO NOT use abrasive cleaners or allow acids to come into contact with the surface. NO SOS Pads. NO Comet. NO Soft Scrub. Bleach, chlorine, or any products containing these compounds should never be used. Be careful with nail polish remover as it will dissolve the surface. Drain cleaner should NEVER come in contact with the surface. If you must use it, carefully use a funnel to pour it down the drain. Use only non-abrasive, liquid cleaners on your refinished surface. Good cleaners we recommend that do not have abrasives, bleach, or chlorine include Lysol Basin and Tile Cleaner, Simple Green, Mr. Clean, & Fantastic. For best results, spray the surface and let it penetrate for 3 – 5 minutes before wiping with a soft sponge or microfiber cloth. Never let shampoo bottles or soap set in the corners or on the surface of the tub. Also, do not use corner shower shelves that must brace between the tub and the ceiling. Instead use a shower caddy that hangs from the shower rod. As a real estate professional or investor, you know time is money. Northwest Tub and Tile gets it right, the first time because we don’t skimp on materials or time. We don’t use inferior chemicals, and we don’t cut corners with our work. You will be amazed at the quality and look of your fixtures. Not every job, and not every client or situation is the same. We will recommend the best product and/or service to meet your needs. We offer complete solutions for your bathtub renovation. We sell and install drain kits, shower rods, shower curtains, and even tub care items. Copyright © 2018 Northwest Tub and Tile Restoration. All rights reserved.